It's January, which means after a month over indulgence a lot of people are getting back on to healthy living bandwagon. Gyms are busy, fridges are full of fruit and veg, however, people's lives are as busy as always and sometimes plans don't happen and you just don't have enough time to prep a healthy breakfast or your on the run and heading towards a chocolate bar. This is where Upbeat comes in. Upbeat drinks are a dairy drink brand who have brought out a range of drinks that are low in fat, high in protein, half the sugar of most smoothies and less than 150 calories per bottle. Protein is a great way to start the day or have as a snack as it keeps you feeling fuller for longer, helping you resist the 3pm biscuits. 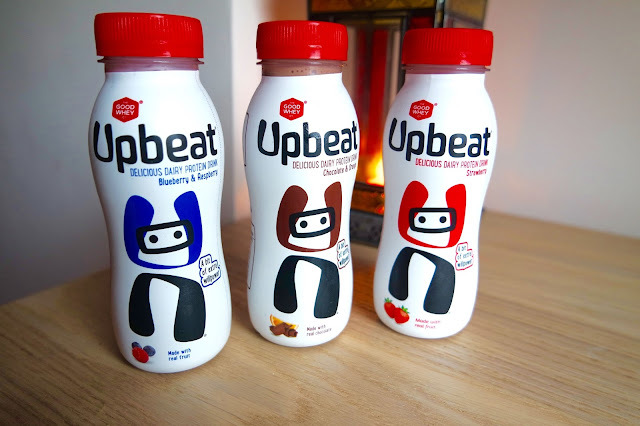 I first heard about Upbeat on blogs earlier in 2015, I was intrigued and went out and hunted them down in the Tesco near my work. I absolutely loved the Mango & Passionfruit and was drinking 2 or 3 a week. A few months later the lovely people at Upbeat and got in touch letting me know about a new flavour on the block 'Chocolate Orange' asking if I wanted to try the new flavour. Off I went to Tesco to hunt down the new flavour and get a few of my favourites. The drinks themselves are really tasty (hence why I've been repurchasing them for so long!) and really smooth and easy to go down. As much I love protein shakes, sometimes they can be tough to drink. None of this with Upbeat! This could be due to the fact they are made with real fruit puree too! Yum. 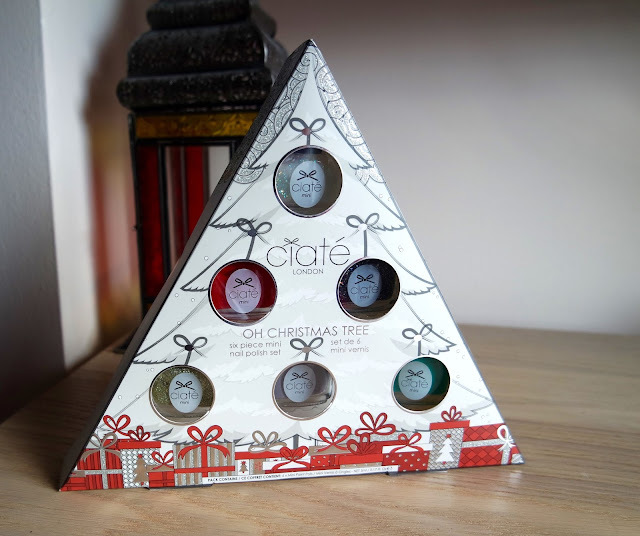 The 4 flavours are all really lovely too, my favourite is still Mango & Passionfruit. Blueberry & Raspberry and Strawberry are joint for 2nd, while Chocolate Orange is lovely it's not my favourite though still delicious. 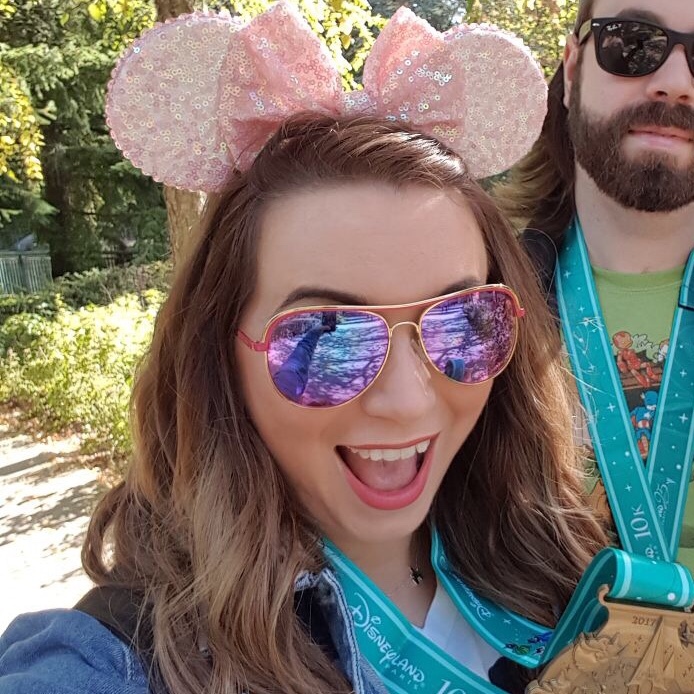 As I was already a huge fan of Upbeat I gave a few away to friends and family, the reviews were overall very positive. The boy really enjoyed them and wanted more, speaks for itself doesn't it! The only slight negative I have about the drinks is the price, at £1.79 a bottle it's not the cheapest for an everyday treat. Especially if you are buying for a family, however I'd definitely recommend having a few in the fridge at all times for when you get up late or that chocolate bar is calling to you. 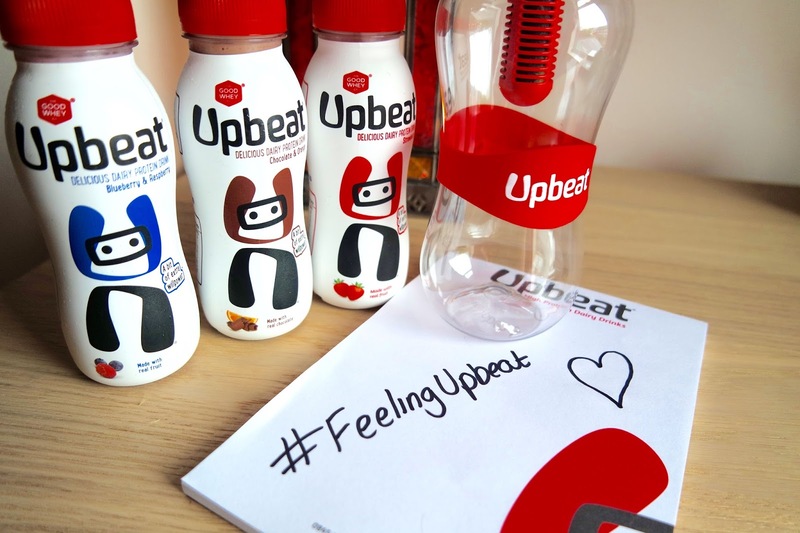 You can find Upbeat drinks in Tesco, Waitrose or Holland & Barrett stores or use the tool from Upbeat for your closest stockist.